16 pp. Roman, 226 pp. The Niger Inland Delta of Mali forms an eco-system of insurmountable importance to its inhabitants. The yearly flooding of these plains by the Niger River facilitate seasonally changing utilisation of resources by different groups, their main economic occupation being determined by their ethnic backgrounds. Moreover, the floodplains offer favourable conditions for fishing, farming and further agricultural usage. But for these ever-changing climatic and topographic conditions, the delta as an economic habitat is of great uncertainty for its occupants. The seasonally and annually changing supply of resources therefore puts degradation of resources and the resulting conflicts at central stage in the Niger Inland Delta. Topics of this research study are institutional agreements on resource utilisation and conflict solving in the Niger Inland Delta. How are access to and use of resources being regulated? What conflicts regarding resource management exist between local parties involved? What are the reasons for these conflicts of interest? When do these conflicts escalate? What strategies do the actors involved use to assert their interests or transform the conflict itself? Which relationships of power play a decisive role here? All these problems are being analysed by way of an in-depth case study in the Niger Inland Delta of Mali. 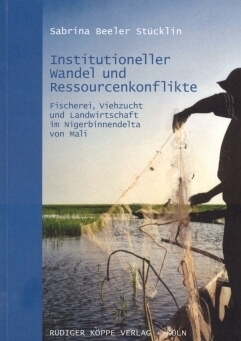 This publication shows that conflicts and resource degradation continue to exist due to dubious legal positions. These problems are perpetuated by the differing interests of all the actors involved, who often times even make a profit out of the current situation, for example by skimming pensions off the top. The winners here are mostly merchants, officials of public services and the local elite, made up of traditional chiefs, traders and the well educated. The poorer resource users, representing the majority, are and have been pushed into marginal resource areas and are being forced to overuse these resources under a great deal of competition, leading to an increase in number and potency of violent conflicts. Mit Recht fordert [...] die Autorin in ihren Schlussfolgerungen, eine genaue Regelung zur Nutzung der natürlichen Ressourcen einzuführen und für deren Durchsetzung zu sorgen, indem alle diejenigen, die sich nicht an die Regeln halten, glaubhaft sanktioniert werden. Dabei müsse auch die Macht der traditionellen Chefs eingedämmt und die Korruption bekämpft werden. [...] Insgesamt ist der Band interessant geschrieben. Er lässt den Alltag der Bevölkerung im Nigerbinnendelta lebendig werden und genügt doch allen wissenschaftlichen Anforderungen. The focus of this study are institutional agreements on resource utilization and conflict solution in this area, describing actors and profiteers. This includes resource management, action strategies, conflict transformation, power relations, and agency. This is set in a historical perspective – insofar as it is a useful context for understanding present processes. This is studied in a concrete case: the fishermen village of Gomina (Daga-Womina), inhabited by the Tié-Bozo (plus neighboring villages Daïebe, Missira, Sabé, Wandiaka) and seasonal resource users. The author shows that resource degradation and conflict mainly occur and persist because of unclear, fuzzy juridical conditions. This situation is kept up since various actors profit from it, it is a form of rent-seeking behavior. Often, the local elite – officials, traders, chiefs, educated persons do profit, with the poor being excluded, which leads to violent conflict. The study is conceptualized along the lines of New Institutionalism (Ostrom, North, Ensminger, etc. ).